Deconstructing the present is the path to understand reality. Jos Näpflin’s empiricism highlights the analysis of his environment : an object or an experience can lead to a reappropriation or a reinterpretation through the creation of a systemoid, which is analogous to a system, established not to be understood but to get people to understand. The understanding of the object deserves to go over the deceptive impressions, such as the work TOTEM. The word « totem » is defined as an animal or a plant which is the symbol for a family, a tribe, especially amoung Native Americans. It is usually a painted or carved figure which represents such a symbol. In its third meaning, totem characterizes a person or a thing that represents an idea. Jos Näpflin’s « unlimited » edition TOTEM brings confusion. 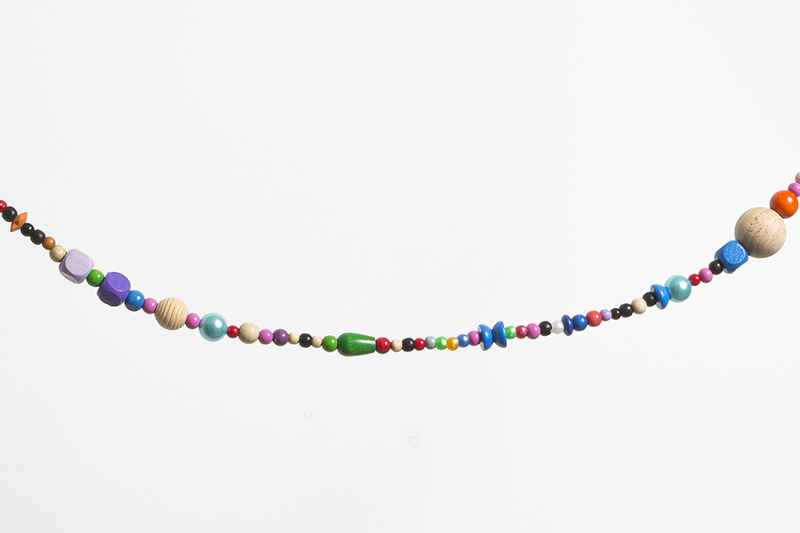 At first sight, the work seems to be a joyful-colored garland, the typical one used for happy events : birthday, wedding… Getting closer to the work, the viewer notices two types of beads : colored ones and translucent ones. Each TOTEM celebrates the life of a dead person. 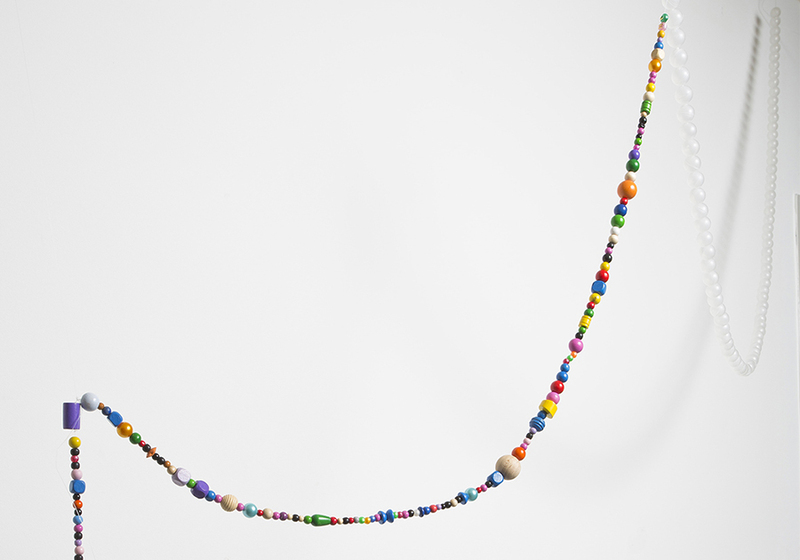 The different shapes and shades of the colored beads symbolize the number of days which have been lived during the last year of existence. The translucent ones are the metaphor of lost days. Visually, the violent contrast brings into opposition life and death. Eros and thanatos intrinsically linked share the same garland. This visual representation of human life is based on a sensitive approach, the materialization of time, like a fresco. As Paul Valery explained in Aesthetic Infinite, the artist is a dual person because the artist creates the laws in order to produce the universe of sensitive resonance.2 In this way, Jos Näpflin’s work reveals hidden senses and perceptions. 2 VALERY, Paul, Aesthetic Infinite (1934), in Œuvres, tome II, Pièces sur l’art, Nrf, Gallimard, Bibl. de la Pléiade, 1960, 1726 pages, pp. 1342-1344.